A player who has been on the radar since he was a 15-year old playing up at the U17 World Championship nearly four years ago, Justin Jackson was hampered by a nagging groin injury that relegated him to just 3 minutes in the game and made it difficult for him to show his best over the course of the week. 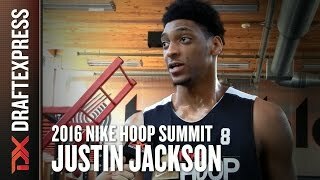 Jackson had some of the most impressive measurements seen from anyone at this event on either roster, standing 6'7 with an outrageous 7'3 wingspan, a 229 pound frame and gigantic hands. While not freakishly athletic, he's easily big enough to play power forward at pretty much any level, and may even be able to operate as somewhat of a small-ball 5 in the Draymond Green mold. Jackson's perimeter shooting is one of the biggest keys to his ability to develop into a high-level NBA prospect. He shoots a set shot with a long and slow release and tons of arc underneath his jumper, but has a reasonably compact and consistent stroke that goes in at a decent rate. He still looks a ways away from developing into a prolific outside shooter, but at least has a framework to build off with the right coaching and work ethic. Jackson has always been a solid ball-handler, and he was very aggressive looking to push the ball in the open floor and get to the basket. He has a solid first step in the half-court as well, even if he's not the most advanced ball-handler you'll find, as is still figuring out the nuances of creating high-percentage looks for himself and his teammates off the bounce. He tends to just lower his shoulder and attack the defense in a straight line regardless of what's in front of him, even though his passing ability seems to have improved over time and he can create a bit for others in drive and dish situations. Defensively, Jackson has great tools with his strength and length, and is willing to put the effort in to get stops. He shows good instincts on the glass, in the passing lanes and even blocking shots on occasion, which could help him develop into a multi-positional defender in time as his feel for the game and experience-level improves with better coaching. While somewhat under the radar after playing at a small school in Canada this past season, Jackson is very much an interesting prospect still who could make a significant impact at the college level as a freshman. He's currently committed to UNLV, but the recent coaching change may change things still, and there's little doubt he would get offers from anywhere in the country should he elect to reopen his recruitment. -Tremendous defender. Smothers opponents with length. Plays hard. -Very poor shooter at this stage. Needs to work on shooting mechanics. Elbow locked in. Release not fluid. Outlook: Was by far the youngest player at the U17 World Championship at just 15 years old, but had no problem competing against the older players. Was Canada's best player in many stretches. Not a brilliant scorer, but finds ways to score, primarily in transition. Very physically mature for his age. Will be very interesting to see how he continues to improve as he gets older.